Well, my love, here we are at year marker three. From my perspective it hardly seems possible that over a thousand days have passed since you left for heaven. Yet, it has indeed been that long. For you I imagine the time has sped by quickly, for we know that time in heaven is not measured as it is here on earth. I still ponder how it is that my days have sometimes seemed so painfully long, and yet, after a thousand of them have passed I am amazed at how quickly they have gone by. Counting these "anniversary" days is not at all like counting the other special days we had together. And there is the key word - "together". We did those special days together - and we did them well didn't we? It came to my mind today that we no longer have those days to celebrate together - because you are there and I am here. Yes, love, Happy Heaven Day! Did you hear me sing the song as I lit the candle and blew it out? I am thinking you did. The first year I hibernated. The second year I cried a lot. This, the third year, I determined would be different. I no longer want May 22 to be a day of mourning. Therefore, in the years to come May 22 will find me lighting a candle on a cupcake or a muffin and singing Happy Heaven Day to you. To be sure I still grieve; I still miss you like crazy; I still shed some tears. I struggle with loneliness and finding direction but it's getting better. I've started this blog. I have become a contributing writer for A Widow's Might. I've lost enough weight to cause a medication adjustment. And - get this one - I bought a string trimmer, assembled it myself, and cut the weeds down! Bet you never thought you would see that did you! Life alone is certainly not easy. However, you taught me so much in the years we were together and that has served me well. There are so many times I have needed to get something done by myself and I "remember" something you taught me. So, today my love, I celebrate your 78 years of life here on earth; but more importantly your 3 years of eternal life. I am overcome with joy to know that you are there - healed and whole. You have no more pain, no more sorrow, no more wheelchair or useless limbs. You have heard Jesus say "Well done, good and faithful servant". And that my dear is definitely reason to celebrate. And with that I am at peace. Thank you Linda for sharing that touching letter with us. It has been 10 1/2 months for me and I'm starting to think about that one year mark. What a great way to celebrate your anniversary. Not sure what to expect but I'm encouraged by you and others in the group. Just like God has held me gently in His arms during this process I know He will continue to do so. On our first anniversary I'm sure He will show me how to celebrate it. Thanks again! Dear Linda ~ This was so uplifting. Knowing my dear husband is in heaven gives me peace and joy. It's almost 30 months since he left and there's not a day that I don't miss him. The missing does not go away. 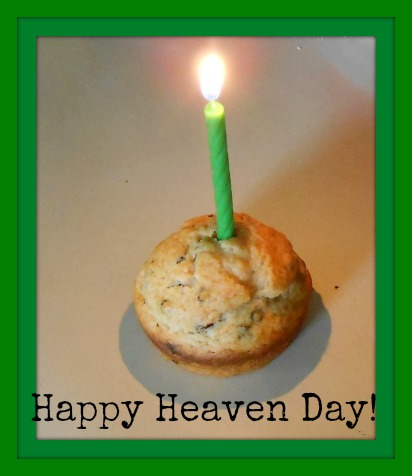 I love the 'happy heaven day' and think it a wonderfully positive way to celebrate your husband's heaven going. Thank you for your posts this week, Linda. They have been a blessing. I was especially touched by today's post. I too rejoice that my husband is free from his wheelchair and his disability. He is singing praises to God with the other saints who have gone on ahead. I miss him, but how could I ever wish him back when he is experiencing this joy?